Get more done with lightning-fast printing and copying speeds of up to 50 pages per minute (ppm) with the HP LaserJet M9050 Multifunction Laser Printer Refurbished. Print and scan wide-format documents such as spreadsheets or architectural drawings with the 11 by 17 inch printing capabilities of this versatile MFP. The color scanner delivers 600 by 600 dots per inch (dpi) for high image quality. Use the included scan to e-mail and additional digital sending features to transform document workflow processes with fast, easy conversion of paper-based documents into electronic files. Use the dual-head color scanner on the automatic document feeder (ADF) to copy and scan double-sided originals. 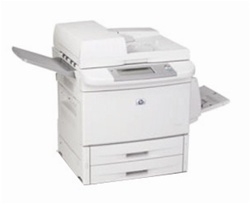 Reduce printing costs, save time, and make paperwork more manageable with automatic two-sided printing and copying. Choose one of four available output solutions, including the eight-bin mailbox, stacker, stacker/stapler, or multifunction finisher to make your HP PCW-CC395AR#BCC M9050 work to its fullest potential. Meet your needs with fast, high-volume, cost-effective printing and copying, digital sending, automatic two-sided printing, and advanced finishing options.